BSNL Penta WS 708C, brings a very affordable option for those out there looking for a genuine Tablet PC which also enables them to make voice calls over the numerous telecom networks. Needless to say that the fight is tight in the budget tablet segment. So, all the manufacturers in the business are trying to put their bests forward, with nothing short of compelling and competitive prices. 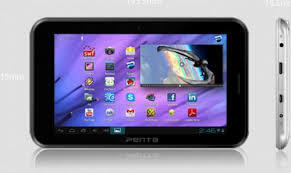 BSNL Penta WS 708c runs on Android’s latest version OS i.e. Jelly Bean. It houses an optimum processor and RAM to give an effortless functioning of the device. The dual camera works as good as any contemporary Tab in this price range. Voice calling is impeccable and one can not expect any better quality. This tablet pc is a big bang on the buck if you are looking for a calling tab with all sort of other usual functionalities tied to tablet pc.